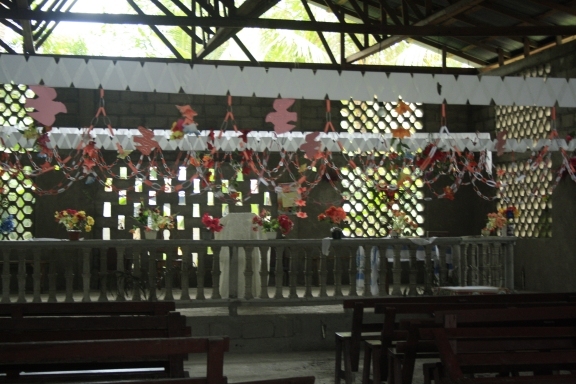 Our final workshop took place in Limbé, in a concrete church decorated with toilet paper, colourful paper chains, paper doves, plastic flowers and palm boughs shaped into hearts. Considering all I had seen in the previous weeks, these decorations gave me such a sense of happiness. I pictured the camaraderie that created this…the laughing and teasing as they made paper chains and wrapped toilet paper around wires. I had a sense that many of those present were dressed in their Sunday best for the occasion. As always, those gathered started the session off with a prayer and a hymn. A tall man in a white shirt and dark glasses sang solo, his sweet voice lifting high into the rafters, then the rest joined in on the chorus. I didn’t understand the words, but didn’t need to. I was sure that all of heaven stopped to listen. It is a CHE custom that training sessions take place in a circle, so that no one person assumes superiority over the others present. As we worked through the morning’s series of writing exercises, a group of children hung around the doorway, quietly watching and listening. Then, as dinner time approached, the number of children grew. Our lunches were always prepared by local ladies and arrived in Styrofoam containers. Usual fare was very filling: rice and beans, fried plantain, a piece of chicken or pork, sometimes a spoonful of cooked carrots or beets, or a garnish of tomato, onion and lettuce. During each workshop, I noticed that most of the participants set a portion of their meal aside to take home to their families. Sometimes a few children would arrive to share their mother’s food. Rick, Rhonda, Liz and I always ate sparingly, so our leftovers were put to good use. On this day, we began to eat, all I could think about were the hungry children at my back, watching. I looked at the adults eating before me and it simply felt wrong. But they, also, had empty bellies and hungry family at home. There are no easy answers here. In the end, none of our team ate much, so she took our trays out to the children to share. Later, a tall, angular man came to the door looking for handouts. His shirt fell from his shoulders, his pants were hitched high and gathered around his waist, showing his ankles. Mme Grimard took him outside to speak privately. As difficult and painful as it is to respectfully turn away someone who is asking for money or food, I have learned this is a core value of CHE…to promote self-worth and personal development through independence and work ethic. The result is a strengthened community that relies first on its own assets and abilities. 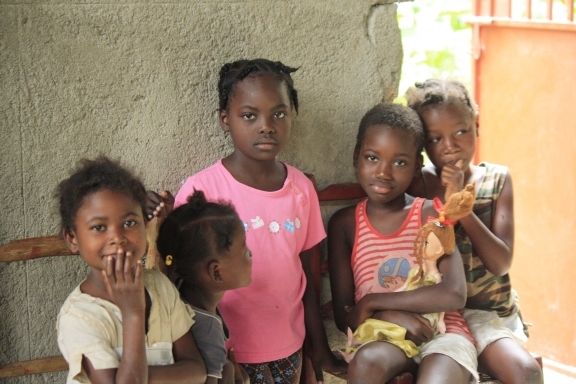 In Cap Haitian, we had encountered young boys of about 14 or 15 along the waterfront. Most likely, they had probably left home to avoid being another mouth to feed and had come to the city to wash cars or change tires to earn a few gourds. When the men in the truck rescued us in the mountains – despite us being foreigners – they did not ask for anything, saying they could easily be in the same situation and in need of help. And when I spoke to Liz about giving the women washing clothes in the creek something for allowing me freedom with my camera, she was careful to explain to them that I was a photographer who would get paid for photos, so I wanted to pay them as well. Several times during workshops, participants mentioned that it was them doing all the work, not me. This was important to them and they seemed very pleased with this. Basically, the goal of the exercises was not just writing, but to help participants to ‘see’ the value in their own stories. To first lift memories to the surface, then to encourage reflection upon the wider significance of their experiences. I also hoped they would begin recognizing and appreciating their own natural abilities and those in others. On this day, in particular, they astounded me with their character observations. We took a group photo and wrapped up early as rain was expected and many had a long distance to travel home. Despite wearing their good clothes, they would either walk, hire a motorcycle, flag down a tap-tap or take a derelict school bus reborn as public transit. It was common to see up to 4 people on a single motorcycle. Our own truck had broken down that morning, so Liz, Rhonda and I had to hire motorcycles (about $1 each) take us home. As we waited at curbside, the thunder rolled overhead. So did my stomach. I had not been on a motorcycle since my teenage years. Shortly, our three chariots arrived and the first raindrops started as we drove away. Within seconds, the Haitian skies cracked and we were driving through sheeting rain as lightning flashed across the mountains. I spoke no Kreyole and limited French, so hoped the driver knew where he was taking me. I felt terrible that he was getting soaked along with me, but he seemed quite used to the weather. Holes in the road filled quickly with water, and dirt turned slick with mud. The driver wove through traffic, and as we passed a large delivery truck on the right, it swerved around a hole and cut us off. We veered further right, narrowing escaping the ditch. 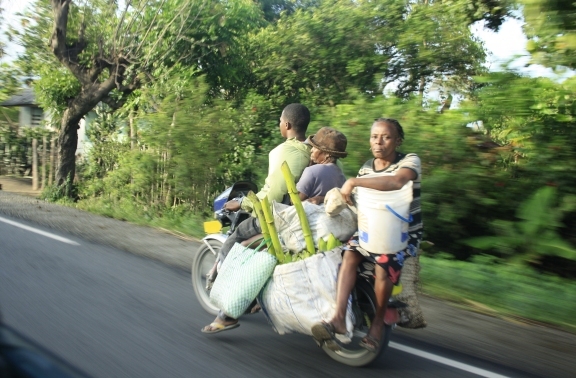 We followed behind a tap-tap filled with Haitians who were laughing and pointing at the rain-soaked ‘blan’ on the back of the bike. It’s probably not a sight they see often. I laughed back, starting to enjoy the experience. I have no idea how my driver could see through the rain without a windshield or a helmet. I kept peering around his shoulder, thinking if we were to hit a pothole or skid off the road, I wanted some advance warning so I could throw myself in the proper direction (preferably away from the wheels of a bus), but the rain in my face made it impossible to watch for long. 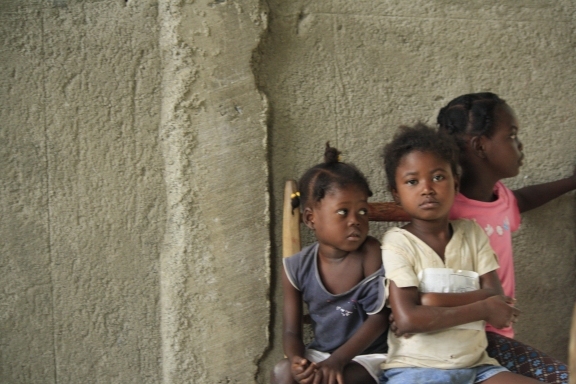 A cold shower and a change of clothes later, so ended my final day in Haiti. 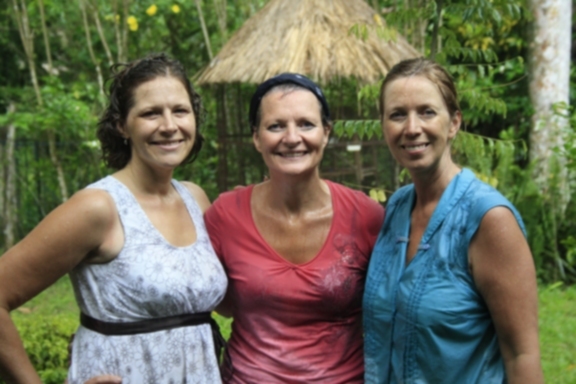 Thanks for sharing your experiences in Haiti, Deborah. It’s been four years since I returned from visiting some house churches in Cuba — but I think about the people I met all the time. I didn’t have to drive on the back of a motorcycle in the rain though. Yikes. Hi Kent – while I’m not really a fan of motorcycles, it did prove an hilarious experience to end a sometimes-emotional and exhausting trip. This was a really good post. This is what we often miss in the West…we think that writing a cheque absolves us of responsibility, but really it only reinforces the we-must-take-care-of-them attitude. At the heart of every need lies an opportunity to form relationships and grow together. That’s why I love Compassion Canada so much, and have given them my time and money over the years. They understand this very well and offer their services accordingly. As usual, your words took me right into that place with you. I didn’t need the photos to see it, but they were wonderful, all the same. 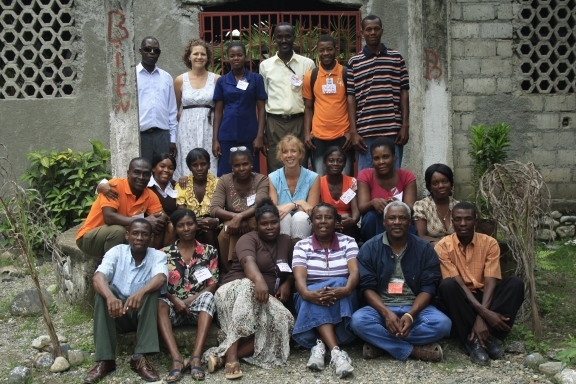 I love the philosophy of this group and their great desire to help people, while preserving their dignity. And I love that you were there, helping them to write their stories and discover their great value in the sight of God. Welcome back home. This has been a real insight for me, particularly since you have been so astute in your observations and in taking such care to take into account the Haitians perspective. I’m sure you will tell us more once you’ve been able to adequately ‘take stock’ from a distance. Again, thank you for sharing this and welcome back. 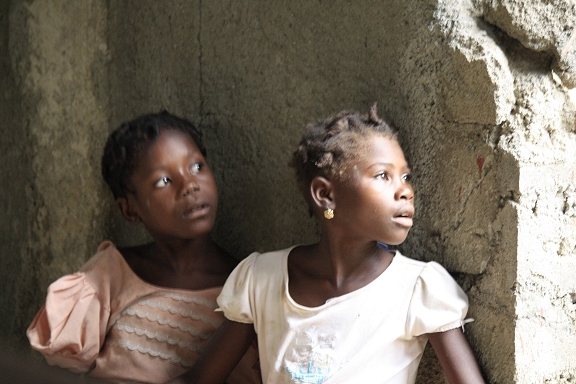 I loved this final day post in Haiti….your storytelling just gets better and better. The photos are remarkable….such images of thoughtful writers, hard at work becoming story tellers themselves. Thank you for sharing your journey! So many stories spill from the eyes. Oh but that one face … yours.